The vast outdoor bore witness once again as the metro’s most avid active sport athletes and race warriors went head to head and pushed their physical capabilities in the recently concluded TEVA Trail Challenge held last July 28. Strategically organized to gather individuals with a passion for adrenaline-pumping adventures, the TEVA Trail Challenge also signified the re-launch of TEVA as the ultimate outdoor footwear brand of choice by athletic greats with its uniquely tasteful designs and use of a distinctively innovative technology called the Tevasphere. To further elaborate Teva’s footwear technology, the race took place within the lush eco-community of Earthheaven in San Mateo Rizal, a 20-hectare oasis where runners communed with nature as they race across majestic sceneries and breath-taking mountain landscapes – emphasizing what TEVA is truly all about. Divided into two categories, around 300 runners battled it as soon as the gun fired in the 5k Warrior and 10k Elite race. Challenging obstacles awaited them in each turn of the muddy man-made road and proved to be a grueling test that exhausted their rigors. 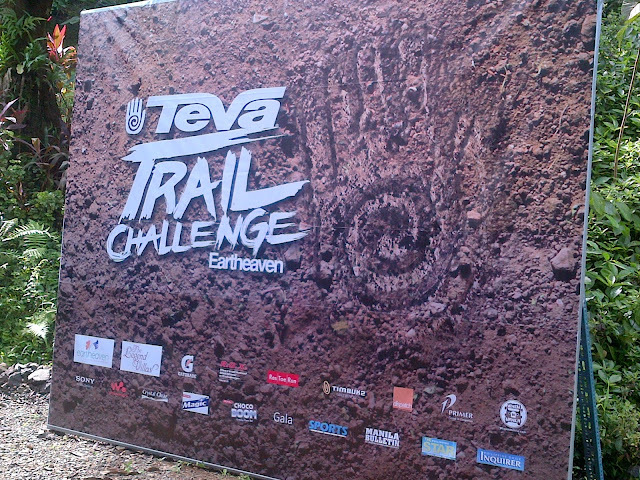 In the end, all finishers took home TEVA loot bags on top of the honor of completing the first-ever TEVA trail challenge in the country. Raffle prizes were also given away. Meanwhile, the top three male and female race winners in each category were hailed as the ultimate trail champions by TEVA along with a slew of memorable prizes. All the fun and excitement certainly did not end along with the race as interactive product booths were set up by TEVA to demonstrate its newest technology. In addition, mini-challenges and random raffle prizes were given away to participants care of the event sponsors. Indeed, the TEVA Trail Challenge proved to be a one-of-a-kind trail running event as it also served as a day that celebrated active fitness. After all, that is what TEVA is all about as it aims to boost the abilities of its wearer with its innovative technologies that will complement all kinds of outdoor activities. All over the world, TEVA attracts passionate adventurers with a love for active sports and a penchant for exploring the great unknown. From its beginnings as a sports sandal brand, it has now evolved into a highly-competitive outdoor footwear brand.